Northwest Immigrant Rights Project, Columbia Legal Services and King County's Department of Public Defense among more than 120 groups that oppose building the facility. High-profile rights groups, including one that works on behalf of immigrants, have joined activists trying to stop construction on a prison for youth that’s being built in Seattle’s Central District. 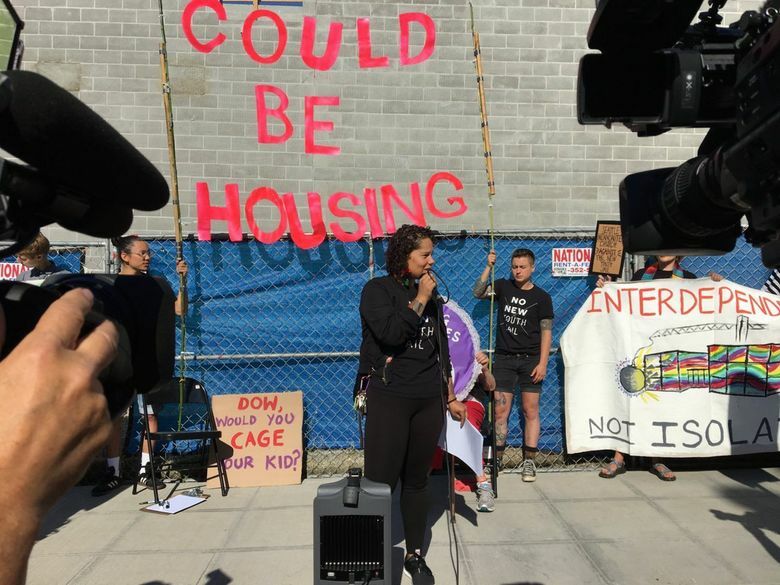 Demonstrators on Tuesday gathered outside the construction site on 14th Avenue, just blocks away from Garfield High School, to reassert their disapproval of spending public money to build the facility instead of directing the funds to other needs such as housing. The umbrella effort, referred to as the People’s Moratorium, announced that more than 120 groups have joined the cause, including Northwest Immigrant Rights Project, Columbia Legal Services and King County’s Department of Public Defense. The rally is the latest effort by the No New Youth Jail Coalition to stop the project. In 2012, voters approved a $210 million levy to pay for a replacement of the existing juvenile-justice complex, of which $40 million was slated for the detention portion of the Children and Family Justice Center. The remainder was planned to fund courtrooms and community resources. State law requires the county to maintain a youth-detention center, and supporters of the new center say it will have fewer beds and more amenities than the existing facility. Opponents of the new detention center have filed a number of legal challenges to the project, including one over the language presented to voters who approved the measure and a second contesting the city’s issuance of a master-use permit for the project. The appeal against the permit’s issuance was dealt a legal blow in May when the state Court of Appeals sided with an earlier King County Superior Court ruling that determined it missed the filing deadline. Opponents also claim King County provided flawed language in the ballot measure to approve construction and that voters had actually only authorized collecting property taxes for the project for one year. King County spokesman Alex Fryer has said the county believes voters understood that it was a 9-year-levy they approved.